More than 78,223,401 beer lovers served! Hours: Monday-Saturday 11:00am-1:00am, Sunday 11:00am-midnight. 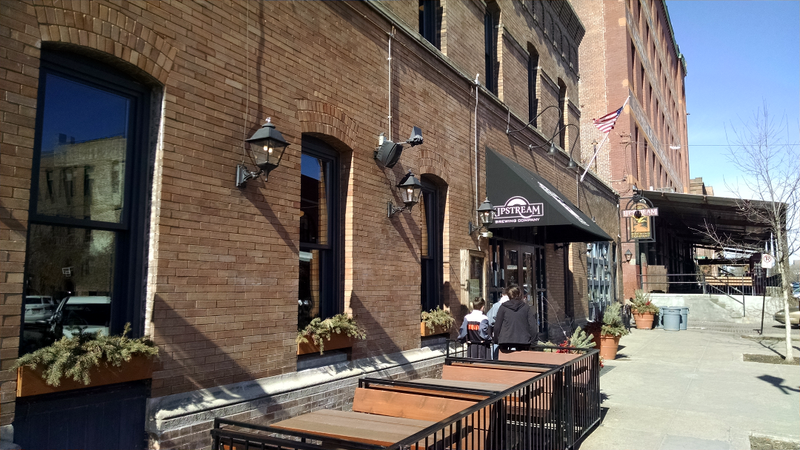 Located in the heart of Omaha's historic Old Market district, Upstream Brewing Company is housed in an historically renovated, turn-of-the-century firehouse. 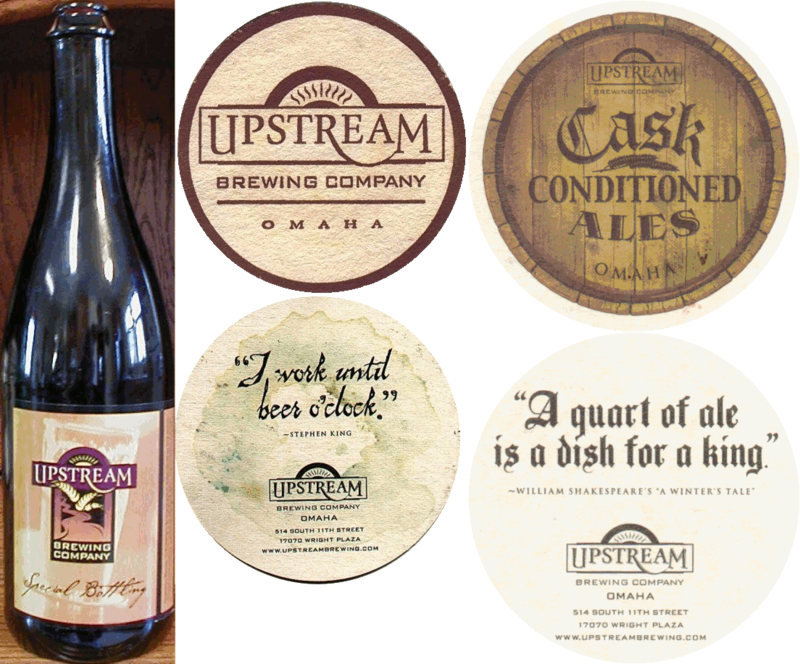 Our name, "Upstream," is derived from the original native American meaning of Omaha; "upstream" or, "against the current." 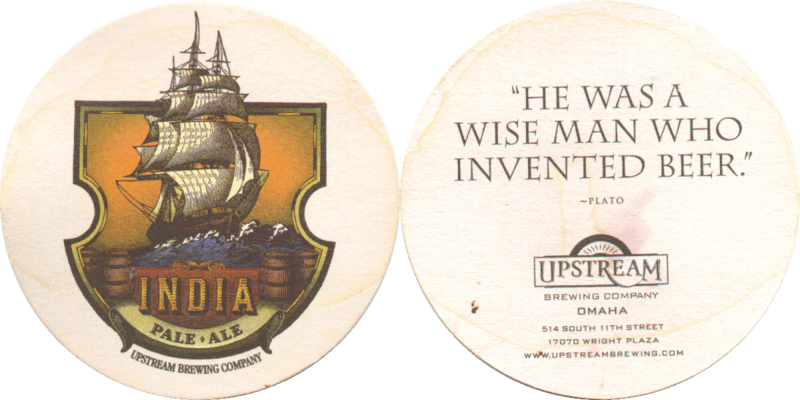 Since its opening in 1996, Upstream Brewing Company has become well-known for its great food, friendly service, terrific beer and spirited atmosphere. The main-floor brewery, open kitchen, and four-sided community bar are a visualfeast. Our brewer features eight beers on tap every day. Our second-floor pool hall features eleven classic pool tables, a fully-stocked bar and access to our rooftop deck. The rousing crowd, great staff and exceptional food make the Upstream a guaranteed good time. 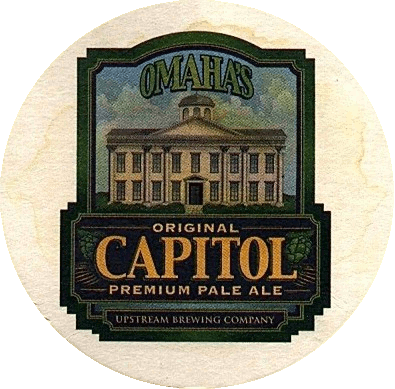 Named Omaha's "Best New Restaurant" by the Omaha World Herald, Upstream Brewing Company is the ideal gathering place - friendly, comfortable and lively! Now I live less than two miles away, so I'm there a bit more often. Bright red-amber. Moderate carbonation. Thick dense head. Huge caramel. Earthy and spicy. Smoky. Bready. Mild grainy malt. Big body. Low fizz. Hugely malty with lots of caramel. Earthy, woody character. Mildly bitter. Mild hop fruitiness. Some bready yeasty flavor. Quite warming. A huge malty beer. I'll need to get another bottle of this for the cellar. "Bottled Sept 06". Big, smooth, roasty, malty. Nice coconut flavor from the barrel. Sweet, smoky finish. Light creamy body, really sweet and wheaty. Just a hint of hop flavor, and the slightest notion of banana. Dark dark red. Big dense head. Peppery, mildly toasty. Mildly fruity. Big, sweet, malty. Mildly roasty. Very mildly spicy. Very mildly warming. Mild coffee, mildly grassy hops. Medium body, smooth. Sweet and roasty, grassy and moderately bitter. Roasty. Mildly floral. Nicely malty. Medium body, creamy. Big floral flavor and fairly roasty. Fairly bitter toward the end. Real big floral flavor all the way through. "Delicately spiced with sweet orange and lemon peel, coriander, lemongrass, rose hips, and our 'secret spice'". Mildly yeasty. Very mildly fruity. Light-medium body, fairly fizzy. Sweet grainy, bready malt, yeasty. Floral, fruity hop flavor, medium bitterness. Still yeasty in the finish. Amber. Some haze. Dense head. Light body, fairly fizzy. Big citrusy, lemony hop flavor, medium bitterness. Mild toasty sweet malt underneath. Finishes fruity and clean. Light body, moderate carbonation. Tart and nicely sweet. Tropical fruit hoppiness, not all that bitter. Actually nicely balanced. Dark caramel malt, burnt toast. Medium body, creamy and fizzy. Sweet and smoky and malty. Red brown, low carbonation and head. Pretty clean aroma. Medium body, sweet, caramel, LOTS of alcohol. Drying at the end. Darkish amber, low carbonation, moderate head. Mildly citrusy aroma. Medium body, fairly bitter, hint of caramel. Very toasty. Hint of raisin. Light-medium body, fizzy. Really toasty, biscuity. Reasonably sweet. Mild grassy hop flavor, low bitterness. A bit grainy in the finish. Medium-big body, smooth. Rich caramel malt and grassy, citrusy hops. Not overly bitter, but nicely balanced. Clean, resiny-grassy finish. A little boozy, a little roasty. Thick, chewy, with a little bit of fizz. Malty, with a nice whiskey note. Some sherry, and the merest hint of tartness. This was a great beer when it was released in September 2011, and it's not too bad today. 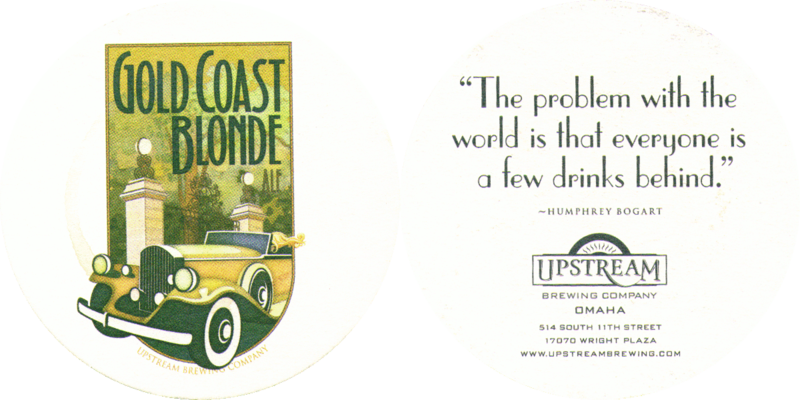 Golden, no carbonation, moderate head. Smells slightly fruity. Light body, citrusy. Bright golden. A bit chunky at the end of the pour. Moderate foamy head. Tart, malty, earthy, grassy. Peppery like jalapeños. Even a bit minty. Medium body, smooth. Really malty. A bit tart, but nowhere near as complex as the aroma. Tasty and warming. Bright deep golden. Thick head. Medium body, fizzy. Big grassy-resiny bitterness all the way through. Lingering resiny bitterness. Not a lot of malt for balance. Golden, some haze, low head and carbonation. Clean aroma. Light body, quick blast of smoky cloves, clean finish. Mild tropical fruit. Mild pine. Medium body, medium carbonation. Mild biscuity malt flavor. Fruity hops, medium-high bitterness. Mango, citrus. Finishes clean. Medium body, smooth. Sweetly malty, toasty, nice coffee flavor. Unfortunate buttery note. Roasty, malty, buttery finish. Red, low carbonation and head. Lots of caramel aroma. Fairly thick, caramel and malty. Odd out-of-balance hop flavor in the middle, some alcohol late. "Like Killian's." Light-medium body, very smooth. Lots of sweet malt. Nicely roasty. Nicely clean. Very low bitterness. Tastes like a beery milkshake. Dark chocolate. Hint of grainy malt. Light body, smooth. Sweet, dark, and reasonably chocolatey, with more than a hint of diacetyl. This is the Malk Sweet Stout with chocolate added. I should have tasted this when it was on tap a few weeks ago. Medium body, smooth. Malty and roasty, with a grassy hop flavor. Maybe a hint of diacetyl. Malty finish with a touch of roast. Bright pale yellow. Moderate head. Light body, smooth. Sweet, mildly sulfury malt. Very low bitterness. Very clean finish, with just a hint of DMS. Black, good head. Chocolate, licorice aroma. Good body, black, sweet, licorice flavor. Amber, low carbonation and head. Citrusy aroma. Medium body, fruity, mildly bitter. Light-medium body, smooth. Mild sweet malt. Mildly smoky, with a non-smoke medicinal phenolic. Fruity perfumey esters. I tasted this beer back in early October; it may be past its prime now. Medium body, creamy. Big roast malt flavor up front, grassy. Fruity, grassy hop flavor, medium bitterness. Fruity, roasty, grainy finish. Copper-amber, some haze. Dense head. Light-medium body, smooth. Floral, mildly resiny hop flavor, medium bitterness. Biscuity malt in the background. Grassy hoppy nicely bitter finish. Reasonably chewy, lots of caramel malt. Toasty and fruity. Medium bitterness. Mild whiskey. Very mild roast. Richly malty. Big coconut-oak character with a shot of rye whiskey. Nicely roasty. Real good beer. Brewed in November 2010, aged in Templeton Rye Whiskey barrels, bottled December 2011. Medium body, fizzy. Sweet and tart, and just a little phenolic. Grassy hop flavor, low bitterness. Sweet lemony finish. Some diacetyl. Deep dark red. Moderate dense head. Sweet and peppery, like Red Hots. Thick and smooth, very low carbonation. Darkly sweet and malty, with a big cinnamon and allspice flavor. Reasonably tasty, but I didn't expect the Xmas-like spices. Light and fizzy. Sweet wheat malt, bready flavor. Big clove flavor, a little grassy. Just a hint of banana.